JOHANNESBURG: Despite being without suspended captain Faf du Plessis, South Africa will be pushing for a clean sweep when they play Pakistan in the third and final Test starting at the Wanderers Stadium on Friday. Opening batsman Dean Elgar was announced as stand-in captain on Wednesday after Du Plessis was suspended for one match after South Africa fell short of the required over rate during their nine-wicket win in the second Test at Newlands. The loss of Du Plessis will inevitably disrupt South Africa’s plans. He has led South Africa to 17 wins in his 27 Tests in charge and was named man of the match after scoring a century at Newlands. Speaking on Sunday before the ban was announced, Du Plessis said South Africa were determined to keep the pressure on Pakistan and win the series 3-0. Du Plessis is likely to be replaced in the batting order by Zubayr Hamza, 23, who will become South Africa’s 100th Test player since the country returned to international cricket in 1991. Hamza has been part of the squad throughout the series, primarily to gain experience in the national team set-up. He got a taste of Test cricket in front of his home crowd at Newlands when he took a good catch at fine leg as a substitute fielder. Hamza has a career first-class batting average of 49.29. A second change in an already fragile batting line-up may be necessary, with opening batsman Aiden Markram facing a fitness test on Thursday after suffering a right thigh injury which prevented him from batting in the second innings at Newlands. Uncapped Pieter Malan, a teammate of Hamza at the Cape Cobras franchise, is on standby. Du Plessis’s ban may also cause South Africa to question the wisdom of fielding an all-seam bowling attack, which inevitably puts pressure on over rates. The Wanderers is the ground where South Africa have most often fielded four fast bowlers and left-arm spinner Keshav Maharaj has only played in one of a possible three Tests at the ground since becoming a regular member of the squad. The pitch received a "poor" rating from the International Cricket Council after a Test against India last season. A repeat would cause the ground to be barred from staging international matches for a year and it seems unlikely the surface will again be prepared to give an undue advantage to fast bowlers. 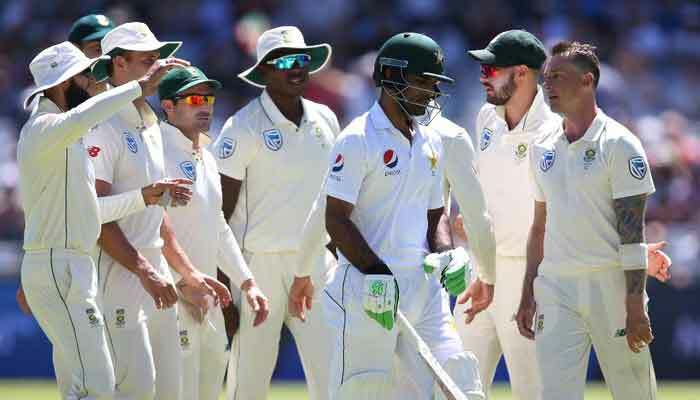 Pakistan’s batting has been inadequate against South Africa’s fast bowling, although Shan Masood, Imam-ul-Haq, Asad Shafiq and Babar Azam have all played useful innings. The bowlers, too, were disappointing at Newlands, so it seems likely there will be changes. But the options for the tourists are limited. Shadab Khan and Faheem Ashraf could both come into consideration as all-rounders after Pakistan’s four specialist bowlers were worn down during South Africa’s first innings of 431 at Newlands.